This will be a concert of improvisations by three of the Bay Area's most creative and versatile musicians. 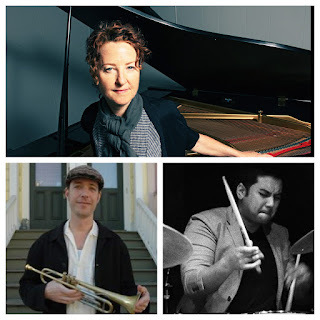 Internationally celebrated Myra Melford on the piano, Darren Johnston on the trumpet, and Hamir Atwal on the drums, will begin from scratch, and follow the music wherever it takes them. This is sure to be a dynamic and exciting musical adventure. This concert is $20/$10 Students (suggested donation). Since settling in San Francisco in 1997, Canada-born trumpeter/composer/songwriter Darren Johnston has collaborated and recorded with an extremely diverse cross-section of artists. His interests rotate around composing instrumental music, writing songs, and performing all styles of jazz, experimental and purely improvised music, as well as traditional music of the Balkans, Greece, Macedonia, Turkey, and the Arab world. These interests have coalesced into his primary ensemble of late, Darren Johnston’s Broken Shadows. He has performed and/or recorded with luminaries such as Electric Squeezebox Orchestra, Fred Frith, Meklit Hadero, ROVA Sax Quartet, Ben Goldberg, Matt Wilson, Mark Dresser, Marshall Allen, Dave Rempis, Larry Ochs, Marcus Shelby, and others.